Wilson was at his best in the win over the Chiefs on Sunday Night Football. He only attempted four passes of 20 or more yards downfield, but he completed three of them for 101 yards and a touchdown. When the Chiefs weren’t able to get pressure on him, he completed 11-of-17 passes for 173 yards and two touchdowns. Chubb has enjoyed an impressive rookie season, buoyed by his work after contact, and he showcased that again in the Browns’ win over the Bengals. He averaged a whopping 5.26 yards after contact per attempt on the day, while he added two forced missed tackles. Baldwin was sensational in the Seahawks’ win over the Chiefs, catching all seven catchable passes thrown his way for 126 yards and a touchdown. His performance had it all, from touchdowns to highlight-reel grabs, setting the Seahawks up well as they head into the playoffs. It won’t be easy to find positives for the Steelers, as they face up to the fact that they need a Cleveland Browns win next week to win the AFC North, but Antonio Brown once again delivered for them in the loss to the New Orleans Saints. Brown caught all 14 catchable passes thrown his way for 185 yards and two touchdowns, and has now dropped just one of the 105 catchable passes thrown his way this season. A fourth-round rookie out of Miami produced the highest graded game of his young career in the loss to the Packers. He caught all six passes thrown his way for 82 yards and a score, setting a career high in receiving yards. Woods continues to show his importance to the Rams’ success on offense in what had been a career year in Los Angeles. He caught all six catchable passes thrown his way in the win over the Cardinals, totaling 89 yards and a touchdown. Smith produced a perfect pass-blocking efficiency rating of 100.0, with no sacks, hits or hurries allowed from 27 pass-blocking snaps in the win over the Buccaneers. He also added some impressive work as a run blocker to cap the day off. McCray allowed a sack and two hurries in the win over the Jets, and while that might seem like a lot, it doesn’t look so bad when you consider that the Packers dropped back to pass 65 times. 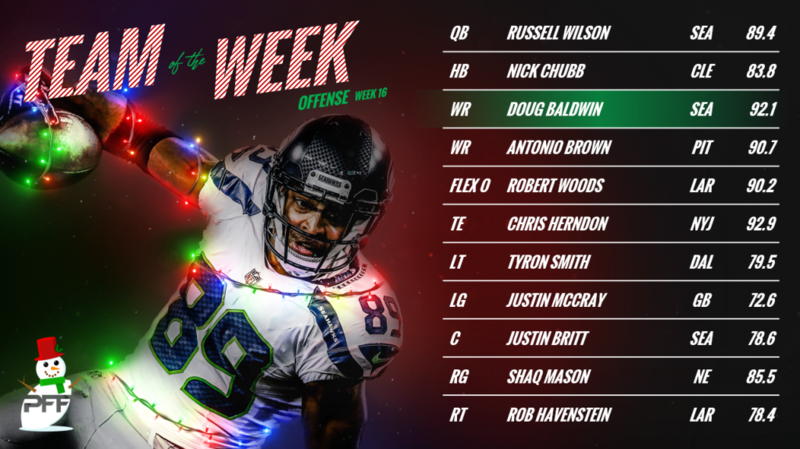 Coupled with some solid work as a run blocker, it’s enough to see him claim this spot on the PFF Team of the Week. Britt had his struggles in pass protection, allowing four hurries in the win over the Seahawks on Sunday Night Football, but it is his work in the running game that sees him earn a spot here. He’s struggled all season in that regard, but that was far from the case in this game, as he delivered one of the top run-blocking performances of the season. Mason delivered by far the top performance by a guard this week, allowing just one hit in pass protection, and delivering some dominant blocks in the running game. Mason is pushing a career year in terms of PFF grade and has made his case as the top right guard in the NFL this year. Havenstein allowed a hit and a hurry in pass protection, but made up for it with an outstanding day as a run blocker, helping to clear room for C.J. Anderson’s big day. One of the top right tackles in the league, Havenstein has impressed both in pass protection and as a run blocker in 2018, delivering a career year in the process. Campbell has quietly delivered as one of the top edge defenders in the NFL once again this season and showcased that again against the Dolphins. From just 22 pass-rushing attempts, he racked up a sack, two hits and a hurry, while adding another two defensive stops. Love was a force in the middle of the Panthers’ defensive line in the loss to the Atlanta Falcons, consistently making himself a nuisance. He finished the game with a sack as a pass-rusher, and two other defensive stops. 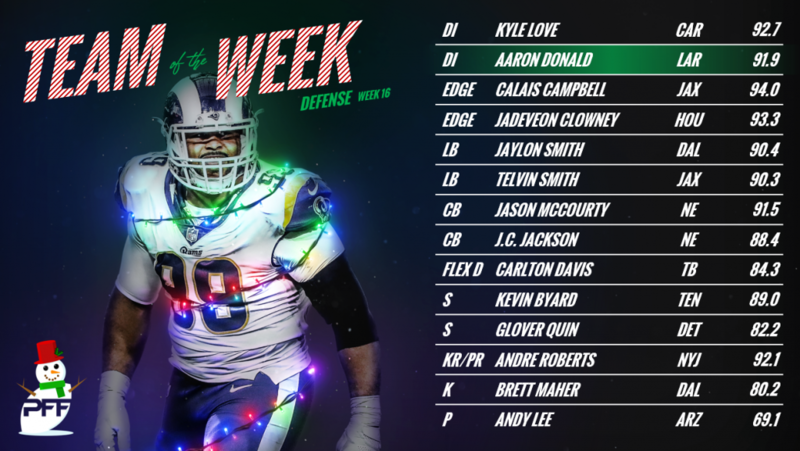 Donald has basically had his name locked into the PFF Team of the Week, and this week is no different. From 40 pass-rushing snaps, he terrorized the Cardinals’ offense, producing three sacks, a hit and seven hurries. Despite committing three penalties in the game, Clowney still made a huge impact, both against the run and as a pass rusher. Over the course of the game, he racked up a sack, two hits and five hurries, and added six other tackles that resulted in a defensive stop. Jaylon Smith delivered arguably the best performance of his career in the Cowboys’ win over the Buccaneers and capped it off with a fumble return for a touchdown. He registered seven tackles in the game (with no missed tackles), and he also had two pass breakups in coverage. Smith was targeted three times in coverage and allowed just two receptions, but it was the one that wasn’t caught which helped him earn a spot here. Taking advantage of an errant Ryan Tannehill throw, Smith took it back the other way for a key touchdown in the game. It wasn’t a perfect day for McCourty, as he did allow a touchdown in coverage, but it was pretty impressive all the same. He allowed just 50% of the passes thrown into his coverage to be caught and came away with a pass breakup and an interception. Jackson was on the field for 45 passing plays in Sunday’s win over the Bills and wasn’t the primary defender in coverage on a single pass attempt. He still found a way to make plays though, as he peeled off to locate the ball on a floated Josh Allen pass and recorded an interception. Quin allowed a touchdown in the loss to the Vikings, but it was the only reception he allowed from 19 snaps in coverage. He was solid against the run too, and overall finished the game with two tackles and an assist from 39 snaps on the field. Byard was the primary defender in coverage on three pass attempts in the Titans’ win over the Redskins on Saturday night, allowing just one reception for nine yards, and coming away with an interception late in the game. He finished the game allowing an NFL passer rating of 2.8. Davis was targeted three times in coverage but allowed just one reception for 13 yards. He also made an impact against the run and finished the game with a defensive stop. A second-round draft pick out of Auburn, this was Davis’ best game so far in his young career. Maher has made some big kicks this season, and yesterday was no different. He went three-for-three on field goal attempts, including a long of 59 yards. Lee punted the ball five times in the Cardinals’ loss to the Rams, with four of those landing inside the opposing 20-yard line. He averaged 49.2 yards per punt and 44.0 net yards per punt. Roberts is our highest graded returner this season, and showed why once again, as he took a kickoff back 99 yards for the score in the Jets’ loss to the Packers. Slater saw 20 snaps on special teams, playing across the kick return, kick coverage, punt return and punt coverage unit. He registered two tackles on the day.